WHY DO WE DO CHILD RESISTANT BAGS? SJoy Enterprises, a leading provider of packaging has announced the availability of “child-resistant” pouches to combat accidental ingestion of poisons by children, especially curious toddlers. With the proliferation of consumer products like detergent pods that resemble candy or treats, there has been an uptick in incidents of accidental poisoning. Our products can drastically reduce these tragic incidents by offering special child resistant packaging to minimize interest by curious children. Various sizes of the pouches and bags can be made by SJoy Enterprises upon request. Each year in the United States 800,000+ children are rushed to the emergency room, victims of accidental poisoning. About 90 percent of those poisonings occur in the home and can be avoided. Our modified pouch comes installed with a special tab requiring two handed dexterity to open the package. It’s easy for adults to open and access the contents, but extremely difficult for children to do so. These bags are great for all sorts of products, from cleaning “pods” that resemble candy to all types of medicine and dangerous products left around the house. Our child-resistant pouches are designed to meet ASTM (American Society for Testing and Material) D3475 (Child Resistant) standards. Opaque and child-resistant, tamper-proof and smell proof. We can also do custom sizes along with custom printing. What are our trade and payment terms: Shipping is normally FOB China. A 50% deposit is required to start any order and the balance is due before shipping. What is our MOQ if custom printing is required? 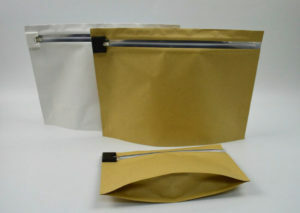 Our minimum quantity for custom printed bags is 10,000 bags. Sometimes it may depend on the custom bag size. What if we require to print custom bags? We need your artwork design in an AI or PDF high resolution file. Our normal master packing: 12” x 9” x 4”. 230-250 pieces per master carton. 20’ container will hold approximately 128,000 bags. 40’HQ container will hold approximately 360,000 bags. Is our special childproof locking device patented? Yes it is patented in China so it cannot be copied by other factories.